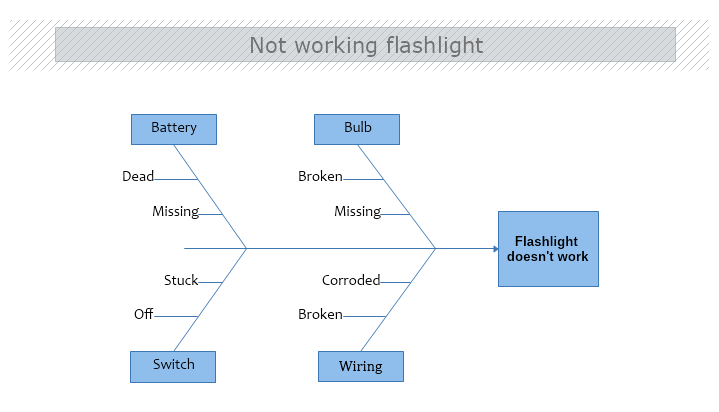 This Causes and effect diagram shows us the work process of a flashlight and all possible reasons why it might not work. All elements described in this template need to be connected and in place in order for the portable flashlight to work. When the flashlight switch is turned OFF, the two contact strips are physically placed apart and the electrical circuit is interrupt. This causes the cut of power supply to the bulb and the flashlight turns off.